When Leader embarked on his career in the 1850s, there was a flowering of ‘The British School’ of landscape painting. He was not, as would be expected, influenced by the established popular exponents of landscape of the time, such as Thomas Creswell RA (1811-1869) and Frederick Lee RA (1798-1879), but was content, as many aspiring young artists were, to follow the Pre-Raphaelite artists’ tenets to copy nature faithfully. A modification of the Pre-Raphaelites' detailed and time consuming style had, by the 1860s, led to a more naturalistic portrayal of nature, and Leader was seen by the art critics of the day as one of the representatives of the ‘New Naturalistic British School’ of landscape painting. Whilst his work from this period owes much to the study of the landscapes by John Constable (1776-1837), John Linnell (1792-1882) and the French Barbizon School, Leader acquired the confidence and facility to develop an independent style. By 1880 he had become a master at exploiting differing natural effects of light, especially the amber luminosity from the late afternoon sun, which became his trademark. He also produced freer, almost impressionistic, landscapes. These were mainly cabinet pictures and plein-air oil sketches and studies, preparatory work for the larger, more finished pictures he exhibited at the Royal Academy Summer Exhibitions. Over sixty-nine years, from 1854, Leader exhibited two hundred and sixteen paintings at the Royal Academy, including three exhibited posthumously in 1923. These Academy paintings comprised only about eight per cent of his total output, which perhaps is not surprising when one considers he was painting for much of his career for a new, prosperous class of Victorian public who were insatiable collectors of art. The Industrial Revolution was an era of opportunity, enterprise and nationalism, when anything ‘British’ was believed to be the best. It was an era which greatly benefited the British artist, whose patrons were the entrepreneurs – the merchants, manufacturers, brewers and bankers, many of whom had accumulated large fortunes – because there was now an economic base on which British Art was able to thrive. It was an age which saw the emergence of both the professional art dealer and the art critic, both acting as intermediaries between the artist and the public. They were the real dictators of taste on whom the artist depended to advance his reputation and financial success. The prolific growth of the printed media, especially the art journals and magazines, could also enhance the reputation of the artist, bringing his work to the attention of a wider audience. For the first time, the non-exhibition-going public had access to an artist's work by means of the art magazines publishing engravings of his paintings. Superior quality reproductions were also offered for sale by the art dealers wishing to promote, and sustain the popularity of, specific artists whose original paintings adorned their gallery walls. Born Benjamin Williams on 12 March 1831, in Worcester, to Sarah, born 1801, and Edward Leader Williams, born 1802, he was the third of eleven sons. His father, an ironmonger, married his mother at the Parish Church, Saint Giles Reading in 1827. Benjamin's first experience of painting seems to have been due to his exposure, from childhood, to the artistic life of Worcester, where his father had taken a leading role in the promotion of British Art in the rather conservative cathedral town. His father was acquainted with John Constable and had copied his paintings in his spare time. However, it was not his father's intention that his son would become an artist, rather that he was to follow in his footsteps; by 1835 Edward was calling himself an engineer and was educated accordingly. Around 1846 the family moved to a substantial residence, Digils House, St Peters, Worcester. On leaving school, in 1845, Benjamin followed his brothers into their father's drawing office to learn engineering, but from the outset sketching in the field was far more to his taste than making plans and sections of locks and weirs. His father finally agreed to give him a year to become a professional artist. Benjamin had been attending evening classes at the Worcester School of Design and was accepted at the Royal Academy school as a student on 24 December 1853, at the age of twenty-two. In his first year he had a picture, Cottage Children Blowing Bubbles, hung and sold in the 1854 Royal Academy Summer Exhibition; purchased by an American for £50 this was a large and encouraging price for an unknown artist’s work. In June 1883 Leader was elected as an Associate of the Royal Academy, but much to his frustration was not elected a full member until 1898. In addition to exhibiting in his home town and the Royal Academy, he also exhibited at the National Institute, the British Institute, Birmingham Society of Artists, Liverpool Academy and Glasgow. 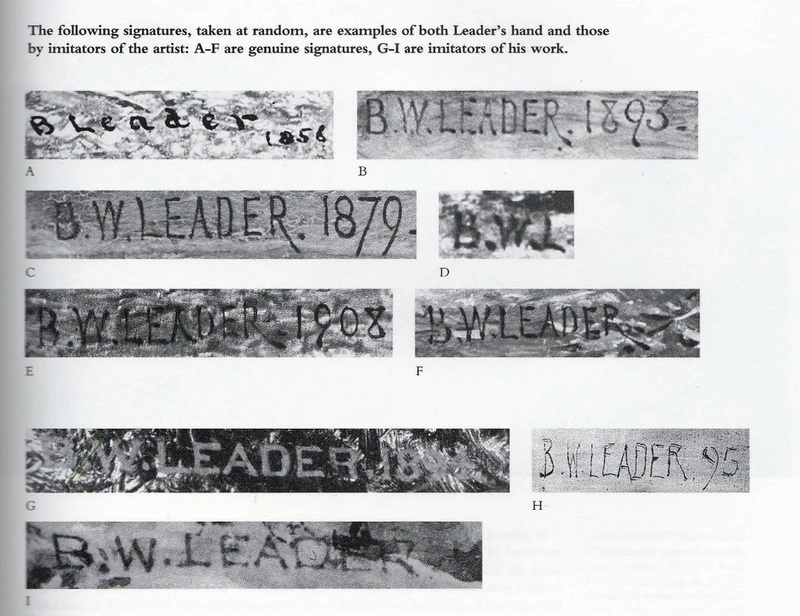 Benjamin changed his surname to Leader to distinguish himself from the many artists whose surname was Williams. 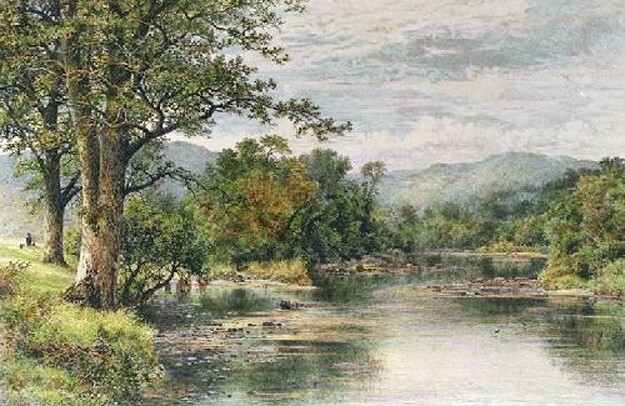 Like many professional and amateur artists, such as David Cox (1783-1859), Leader liked to paint landscapes in and around beauty spots such as Betws-y-coed and Capel Curig in Wales. Leader also often painted from sketches made in the fells of Cumbria, he particularly favoured the Vale of Keswick, although these paintings were not exhibited at the Royal Academy but went to art dealers or were commissioned by gentlemen living in Liverpool and Birmingham. ​twenty year age gap and Leader's family background made for an unsuitable match; Leader’s family were ‘in trade’. Their first child, Beatrice, was born in July 1877, followed by Benjamin, June 1878, Ethel, July 1879 and later Edward and Mary. Leader died at his home, Burrows Cross House, Surrey, on 22 March 1923, a few days after a stroke. He was buried in Shere churchyard in the family grave where his youngest daughter was laid to rest thirteen years previously. His widow continued to live at Burrows Cross House, cared for by their only unmarried daughter, Beatrice, until her death in November 1938 and was buried with her husband. At the age of ninety-two the Royal Academy had lost not only its oldest member but also an artist who, for over forty years, was one of the most popular of its landscape painters in the estimation of the British general public. The obituaries in the local and national press were generous in their praise for the artist. Leader's life and art, firmly rooted in the context of the Victorian era, is relatively unknown today. Yet Leader’s landscapes are an important part of our cultural and historical heritage. They are images of the British rural countryside and its coastlines, painted at a time when the character of the social, economic and natural environment was changing rapidly. It is hoped that one day Benjamin Williams Leader RA will be numbered alongside our great British painters.